Those who think of sonata form as a well-organized dinner plate – with the red meat in one corner, the mashed potatoes stationed opposite, and peas or broccoli distributed neatly over the remaining space – might be forgiven for thinking that Beethoven was playing with his food in composing this sonata, so irregular are its formal outlines and so free its inner patterns of musical thought. of the composer’s late period, a period in which his deafness moved him to express his thoughts in ever more concentrated form, yet with ever greater freedom. The world of late Beethoven is a world of contrapuntal textures, fluid formal boundaries, and not infrequently of ear-filling trills. It is the willful inner world of a composer who has retreated from the realm of sound, but with his love of that realm intact. The first noticeable irregularity in this sonata is that it only features two movements, each of which begins with a slow introduction. Opening a sonata movement with a slow introduction is not an innovation on Beethoven’s part: Haydn had used it at the start of his Symphony No. 103 in E♭, as had Beethoven himself in his Pathétique Sonata, Op. 13. But here its use is different. Instead of portentously building up a sense of anticipation for the section that will follow, the slow introduction of this work’s first movement seems blissfully happy to merely meditate over the main motives that will recur throughout the sonata as a whole: a series of stepwise-falling fourths and a faster stepwise ascent of the same interval, presented by the solo cello at the outset. With a dynamic marking of piano and the expressive indications teneramente, dolce cantabile, this slow introduction is a virtual love-duet between piano and cello. The end of this cheek-to-cheek slow-dancing in the placid key of C major comes all the more suddenly, then, when the sonata movement begins in earnest – in the key of A minor, the relative minor. An opening theme in octaves and unisons between the piano and cello opens the exposition, but expends its fury after two statements, stopping abruptly to allow a musical thought of smaller range, the second theme, to intervene. This abruptness is a characteristic feature of the movement. Beethoven feels no real need to create transitions between sections: he merely stops, as if a new thought has occurred to him, and goes off in a new direction after a pause. Although the exposition is repeated, that is perhaps the most “normal” feature of this movement, which has a compressed development section and a recapitulation which seems ready to luxuriate in a lingering coda – but no, it decides not to after all, and puts a quick end to the discussion. is more a serious affair, introspective and reflective, as if gazing at the stars. At first, the piano and cello seem to be in another duet, trading florid phrases back and forth, but then each retreats to its own corner, the cello ruminating deep in the bass as the piano explores ever higher terrain above. Bringing them back together is the opening theme of the first movement, recalled in a mood so lyrical that it dissolves into a dreamy triple trill before the perky theme of the Allegro vivace bursts its bubble. This theme, an accelerated version of the rising stepwise fourths of the first movement, is uniquely Beethovenian in character. It is both a motivic cell that animates serious discussion in the fugato of the development section, and a toy-like bauble that gets tossed out playfully in a game of tag between the instruments, made all the more humorously dramatic by the numerous expectant pauses that punctuate these mischievous exchanges. Brahms’ second cello sonata is a ‘meaty’ work, the kind that Brahms no doubt would have wanted to play when he was studying the cello earnestly as a young music student in Hamburg. Designed expansively in four movements in the Beethovenian manner, with a third movement scherzo, it combines the impetuous spirit of the younger Brahms with the generous latherings of lyricism that characterize his mature style. friend, the violinist Joseph Joachim. The F major sonata was composed in the summer of 1886, during a summer sojourn in the Swiss countryside, and dedicated to Robert Hausmann (1852-1909), cellist in the Joachim Quartet – the same cellist for whom, with Joachim, he wrote the Double Concerto in A minor the following year. The orchestral sweep of the sonata’s opening, with its rich carpet of tremolando figuration in the piano supporting bold fanfares in the cello line, sets it immediately apart from the subdued opening of Brahms’ previous cello sonata, the Sonata in E minor, Op. 38. This passionate but fragmented first theme in the cello seems to be shouting important news in all directions, like a town crier, while the second theme, announced by the piano, is a more smoothly connected melody. The tremolo figuration of the opening is not just sonic “filler”: it functions as a stabilizing counterfoil to the disjointed character of the sweeping opening theme, and plays a major role at the opening of the development section as well. Especially noteworthy in this movement is the magical passage that prepares the recapitulation, a passage in which time seems to stands still as the cello plays tremolo while the piano enacts great leaps from the bottom of the keyboard to the top. The Adagio affetuoso second movement in simple ternary form carries the major emotional weight of this work. It opens with a procession-like tune in the piano, setting the scene for the cello to emerge in full-throated glory, singing out a richly chromatic but ever-so-lyrical melody that shows off the instrument to advantage in its high range. A middle section in the minor mode gives the piano a place in the sun as well, but the pool of light on the stage in this movement goes to the cello, which returns in the third section to wax lyrical once again, enveloped by an even more lavishly decorative piano accompaniment. If the second movement belongs to the cello, the propulsive energy of the third movement, a scherzo marked Allegro passionato, is driven by strongly assertive piano writing. Cresting and subsiding in waves of sound, the opening section builds up sound resonance through the frequent use of pedal tones in the bass combined with a constant chatter of eighth-note motion above. Adding to the intensity of effect are the typical Brahmsian techniques of 2-against-3 rhythms (i.e. : “hemiola”), and syncopations that recall the opening of the scherzo from the composer’s Quintet in F minor. Where the cello emerges more clearly is in the trio middle section, in which it hums a wistful melody in simple note values. While this tune seems folk- like in its simplicity, a number of odd melodic turns indicate that it has more on its mind than it is letting on. The sonata ends with a fourth movement rondo much in the relaxed vein of the last movement of the Piano Concerto No. 2 in B♭, Op. 83. Gentle and tuneful, its principal theme alternates with a short series of contrasting episodes, none of which spoil the overall mood of contentment that characterizes the movement as a whole. Chopin’s name is so intimately linked with the repertoire of the piano that it is difficult to imagine him writing for any other instrument. And yet he appears to have had a sincere appreciation for the sound and musical qualities of the cello. Not only do his works often feature piano textures with left-hand countermelodies in the cello’s baritone range – his Étude in C♯ minor, Op. 25, No. 7, is a classic example – but he actually wrote three chamber works for cello and piano: an Introduction and Polonaise brillante, Op. 3, a Grand duo concertant on themes from Meyerbeer’s Robert-le-Diable, and this sonata, his last published work, written for his friend, the Parisian cellist Auguste Franchomme (1808–1884). The first movement opens with a sober, almost march-like theme announced in the piano, followed by a deliciously- scintillating pianistic flourish up to the high register, of the sort that must have made young ladies swoon. The cello then enters to take hold of the same melody and works through its melodic implications in a series of passionate interchanges with the piano until a moment of calm intervenes to set the stage for a vocally-inspired second theme of the utmost simplicity. While this movement is in sonata form, with a repeated exposition, the recapitulation is foreshortened and begins with the second theme. Because of Chopin’s habit of splitting melodic interest between the hands in his piano writing, the resulting texture when combined with the cello is extremely rich, frequently offering the ear three melodies to follow at once. long phrases over a simple, arpeggiated accompaniment pattern in the piano. its naïvely simple melody and widely-spaced piano accompaniment in hypnotically regular eighth notes, it recreates some of the intimacy of the nocturne genre, at which Chopin excelled. This untroubled movement, the still point at the centre of the sonata, has no other formal structure than that of a great sigh: it swells into fullness, then relaxes and fades into perfect repose. The rondo-like final movement features themes of some dramatic complexity, most of which use dotted rhythms that play against a recurring pattern of triplets. The melodic and harmonic chromaticism of Chopin’s late style is fully in evidence in this movement, which ends with a stirring coda in a sunny G major. The three Intermezzi Op.117 are, together with the piano pieces of Op. 116, 118 and 119, collectively the last Brahms wrote for solo piano, and are among his very last compositions. Only three more opus numbers followed, and they involved the keyboard as well. In a way, it was entirely fitting that Brahms drew the curtains on his career with music for this instrument. He had been an outstanding pianist himself since his teens. His earliest surviving work published under his own name – the Scherzo in E-flat Minor, Op. 4, written when he was eighteen – was a piano piece, and Brahms continued to write for the instrument throughout his life. The titles of the seven pieces in Op.116, “Intermezzo” and “Capriccio,” are not especially revealing in themselves of any unique properties, though the Intermezzos tend to project a reflective, late autumnal quality in music of quiet resignation and tender sentiments, while the Capriccios are energetic and even passionate. Each is a unique and distinct creation, yet together they constitute a unit greater than the sum of their parts. The entire set opens and closes with a vigorous Capriccio in D minor. Within this framework are found four Intermezzos and another Capriccio, all in keys closely related to D minor and to each other. Malcolm MacDonald, in his monograph on the composer, even makes a case for Op. 116 as a multi-movement sonata, with No. 3 as a scherzo and Nos. 4-6 as the slow movement in E major with a central contrasting E minor section. The motivic unity is striking: the three Capriccios all feature melodic chains of descending thirds, a quality found more discreetly in the Intermezzos as well. Excepting The Seasons, rarely does any of Tchaikovsky’s solo piano music turn up on recitals, and few pianists have championed the sonata on today’s program. Yet here we have a work written on a grand scale that is laden with brilliant effects, passionate writing, Tchaikovskian melancholy and orchestrally- conceived sonorities. There are plenty of critics today who heap opprobrium on the sonata, but such was also the case for the same composer’s first piano concerto, which went on to become the world’s most popular work of its kind. A persuasive performance of the Grande Sonate inevitably leaves the audience wondering why this work is not played more often. The sonata bears no official number, as it is really the only completed work in this genre Tchaikovsky acknowledged in his lifetime. He began a Sonata in F minor in 1863 while still a student in St. Petersburg (its single movement has been completed by pianist Leslie Howard), and finished one in C sharp minor two years later, but the latter was not published until after his death, when it was assigned the misleading opus number 80, even though the music antedates his Op. 1. It is sometimes referred to as “Sonata No. 1” today. The G major sonata was composed in the same year (1878) as the Fourth Symphony and the Violin Concerto. It was dedicated to the German pianist Karl Klindworth, but the highly successful first performance went to Nicolai Rubinstein in Moscow on November 2 1879. The opening fully justifies the appellation Grande Sonate in its evocation of processional pomp and splendour. During the course of this highly energetic sonata-form movement Tchaikovsky incorporates three well-contrasted subjects. The development section is unusually dramatic and elaborate, the textures at times approaching orchestral density. The slow movement, like that of Beethoven’s Seventh Symphony, is based more on harmony than on melody. Nevertheless, it is imbued with typically Tchaikovskian melancholy in the outer sections, and with inspired lyricism in its central episode. The Scherzo departs from the standard model in its unusual metre of 6/16, which involves two sets of triplets per bar. Many listeners and commentators find this the most interesting movement of the sonata, one marked by sparkling brilliance, intriguing cross rhythms and exquisite delicacy. No fewer than four themes are incorporated into the rondo-finale. Most memorable are the opening refrain and the sweeping melody that sounds for all the world like an operatic tenor pouring his heart out to his lover. More than half of Brahms’ total output was vocal, including over two hundred art songs and an additional hundred folksong arrangements. Most of them are serious, introspective, resigned or elegiac in mood. Ardent, impulsive effusions are rare, and the musical pictorialism so dear to Schubert is likewise largely absent. But there are always exceptions to generalizations and the Zigeunerlieder (Gypsy Songs) are just that. In 1887-88, Brahms set eleven Hungarian folk texts, translated into German for him by Hugo Conrat, as vocal quartets with piano accompaniment. He described them to a friend as “excessively joyful.” Biographer Malcolm MacDonald reminds us that they “skillfully combine the appeal of his two most popular and successfully marketed works, the Hungarian Dances and the Liebeslieder Waltzes. In 1889, Brahms transcribed eight of them (omitting Nos. 8-10) for solo voice and piano. All are love songs. Respighi’s name is so closely linked to his sensual, sensational musical portraits of Rome (the pines, fountains and festivals) that it is all too easy to overlook his contributions to the vocal repertory, which include nine operas of various dimensions and about 75 songs. The haunting “O falce di luna calante” (The setting crescent moon) is set to words by Respighi’s favourite poet, Gabriele d’Annunzio, and deftly captures the quality of gentle, pale light of a silver crescent in the sky. “Nebbie” (Mists), set to a poem of Ada Negri, was composed for mezzo-soprano, but tenors (including Pavarotti) have adopted it as well. This extraordinary song is sung to grim, slow-moving blocks of sound in the accompaniment while the vocal line twice rises and falls over the range of an octave and a half, simultaneously covering the dynamic range of piano to fortissimo and back. “Notte” (Night), also set to a poem of Negri, makes a perfect companion to “O falce de luna calante” with its poetic evocation of the perfumed night. Dvořák’s four songs Op. 82 were originally sketched and composed to German texts, then later translated into Czech and English. The words come from verses from the book Lyric Poems and Translations Based on Bohemian Literature and Folk Poetry by Ottilie Malybrok-Stieler. Biographer Paul Stefan describes these songs has having “great emotional intensity and lyric finish.” Concertgoers familiar with Dvořák’s Cello Concerto may recognize phrases from “Lasst mich allein!” that later went into the concerto. This is a love song in which the lady begs to be left undisturbed so as to better savour the memories of her beloved. This strophic song is justly regarded as one of Dvořák’s greatest. The remaining songs also address aspects of love, the second in the context of work bringing comfort to a pained heart, the third a reflection of the warmth and beauty of nature renewed, and the fourth a metaphor for a brook burbling along bearing the poet’s sorrow. The aria “Na to bych se podivala” comes from the composer’s second opera, a one-act rustic comedy called Tvrdé palice in Czech. It was rendered into German as Dickschädel (Numbskull), from which it made its way into English variously as The Stubborn Lovers, The Obstinate Children or the Pig-headed Peasants. An arranged marriage has been set by two village neighbors for Toník and Lenka, who really love each other but pretend not to because their marriage has been arranged without consulting them first. The youngsters’ godfather comes up with a ruse: Toník’s father is rumored to want to marry Lenka, and Lenka’s mother wants to marry Toník. It’s totally improbable, but it gives Lenka the opportunity for a sprightly aria whose opening line, “I’ll have to look into this!”, sets the tone for what follows. Wolf first became acquainted with the poems of Eduard Mörike (1804-1875) in 1878. Mosco Carner assesses the songs resulting from the Wolf-Mörike relationship as “giving the impression of having been written out of the very heart of lyricism, and this thanks to the peculiar quality of Mörike’s verses, which are irradiated by a lambent glow and evergreen freshness of imagery.” Skillful use of chromaticism and dissonance, a wide-ranging harmonic palette, and a keen sensitivity to nuance of word and tone are all qualities to be admired in these songs. The 53 songs in the Mörike collection were all written within the brief period of February to November, 1888, and all but three are about some aspect of love. Between 1711, when Rinaldo was first seen on a London stage, and 1741 – thirty years later – when Deidamia was produced there, over forty operas flowed from Handel’s pen, many of them hits on the order of a Steven Spielberg film today. Ariodante (1734) comes from near the end of this run of runaway successes. Ariodante (a male contralto role) is a prince in love with Ginerva, daughter of the King of Scotland. Through various machinations, he is tricked into believing that she has been unfaithful. Near the end of the opera, he has learned the truth about the infamous plot. In “Dopo notte”, one of Handel’s most exuberant arias, he expresses renewed confidence in life, now that his troubles appear to be over. Fire-breathing dragons, dancing mermaids, a black cloud full of demons, a sorceress, an enchanted palace, two full armies, chariots, war machines, a “battle symphony” with four trumpets and much more went into Rinaldo, the first of Handel’s London operas. Rinaldo also holds a special place in the annals of opera in North America. In Act I, Rinaldo’s fiancé Almirena is been abducted by the evil sorceress Armida. In Act II, Almirena bewails her miserable state in one of the most famous of all Handel arias, “Lascia ch’io pianga”. Great operatic comedies are far less plentiful than operatic tragedies. The Barber of Seville (1816) indubitably stands at the very pinnacle of this repertory, and year after year ranks as one of the Top Ten most frequently performed operas in the repertory. Rosina’s entrance aria, “Una voce poco fa”, is indicative of the Barber’s irrepressible good humor and spirit of rascality. It captures to perfection the personality of the coy and clever heroine as she sings first of her secret love for the mysterious stranger Lindoro, and then of her determination to pursue the object of her desire – and woe to anyone who tries to obstruct her! Few works of Claude Debussy (1862-1918) bear generic titles like symphony, quartet, concerto or sonata. Most have descriptive or evocative titles like Printemps, Jeux, Claire de lune, La mer, Nocturnes or Ibéria. Since chamber music tends, more than any other, to rely on the traditional forms of classical structure, it is scarcely surprising to learn that Debussy composed so little in this category. Most of the exceptions are found either in works of his student years or from the end of his life, when he looked more to Classical models and absolute music for his inspiration. Hence we find him in 1915 embarking on a project to compose six sonatas, each for a different combination of instruments. Only three were actually written, as Debussy’s health was rapidly declining. The first of these was the Cello Sonata. The second was for flute, viola and harp; the third (his last composition) for violin and piano. On the title page of the original published edition appear the words “Claude Debussy, Musicien français,” no doubt a pointed indication that his sonatas were not going to be cast in the time-honoured mold of the German masters, but would follow a different path, one not characterized by standard exposition, development and recapitulation sections. It is more the classical spirit Debussy is invoking, not its organizational procedures. “The proportions and form of the Sonata were almost classical in the true sense of the word,” he wrote. Except for the first three measures, the cello plays nearly continuously throughout the Prologue. Debussy took care to advise that “the piano must not fight the cello, but accompany it.” The principal theme is heard as a lyrical, descending line in the cello. This theme returns at the end of the Prologue after a middle section in which the piano momentarily assumes the principal role. Although the sonata is nominally in D minor, the flavour is strongly modal, perhaps in keeping with Debussy’s presumed intent that the sonata evoke the character of old Italian commedia dell’arte. The two main movements are played without pause. The Sérénade throws out bizarre whorls of sound much in the manner of a moonstruck, crazed harlequin careening about the stage. Sarcasm, banter, and an air of the fantastique are created through the use of special effects for the cello including pizzicato, glissando, sur la touche (bowing over the fingerboard) and flautando (delicate, flute-like sounds). The Finale, like the previous movements, leaves the cellist scarcely a moment’s rest, but the piano writing is far denser than in the Sérénade. Cello and piano engage in exuberant dialogue and reckless antics, pausing only for a moment of quiet reflection before resuming their drive to the finish. The first performance of the Cello Sonata was given in the fall of 1915 by Joseph Salmon with the composer at the piano. Beethoven wrote only five sonatas for cello and piano, but like the 32 sonatas for solo piano, they span most of his creative life. They were written in three spurts of activity: two (Op. 5) in 1796 at the very outset of his career; one (Op. 69) in 1808, squarely in the midst of his career; and two more (Op. 102) in 1815 when he was moving into what musicologists would call his Late Period. As with so many other works by Beethoven, his cello sonatas are of pioneering importance in form, content and the advancement of instrumental technique. The two sonatas of Op. 102 were Beethoven’s principal works from the year 1815. They were written for Joseph Linke, cellist of the Schuppanzigh Quartet which had premiered many of Beethoven’s string quartets. These works are often regarded as the portals through which Beethoven entered his Late Period. The English scholar Martin Cooper notes that the sonatas of Op. 102 “show a combination of characteristics which do not appear in any earlier works of Beethoven’s with anything like the same consistency of concentration.” These characteristics include the prevalent interest in counterpoint, the use of trills and other ornamental devices as ends in themselves, syncopation, frequent and abrupt contrasts of pitch, bold harmonic progressions, and exploration into new realms of formal design. The D-major sonata’s impulsive force and scope are announced in the opening bars, which feature a five-note figure that will pervade the entire first movement. Both principal themes reveal soaring lyricism, the first dramatic, the second more vocal in style. Only in the coda does the headlong rush of events subside. The sublime, deeply introspective second movement is a long-breathed lamentation in D minor that exploits the cello’s most sonorous range. It is one of the most moving slow movements in all Beethoven, comparable to some of the utterances of the great final piano sonatas and string quartets. Its alternation of simple chordal writing and richly embroidered figuration also link it to the composer’s transcendental slow movements of his Late Period. The Finale is no less astonishing. Here, for the first time, Beethoven incorporates a full-fledged, four-part fugue into an instrumental work, a practice he was to continue almost obsessively in his later works. 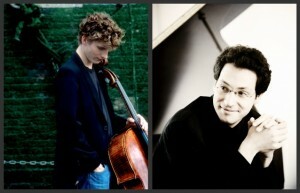 It is announced in the cello, with the remaining three entries given to the piano. All the traditional fugal techniques are brought into play: statements and counterstatements, inversions, imitations, episodes and stretto. The fugue culminates in a flurry of scales and trills. As Kodály had studied the cello as a youth, it is not surprising to learn that he wrote generously for this instrument. For cello and piano his catalogue includes, in addition to the work on this program, a Romance lyrique, a Sonatina and a Hungarian Rondo (originally with orchestra). For unaccompanied cello there is a capriccio and a sonata, and for violin and cello a Duo. When Kodály began working on the sonata for cello and piano in 1909, he intended it to be a three-movement work in the classical tradition, but he never completed more than the two movements we have today. Many years later, shortly before the two movements were published in 1923, Kodály made a last attempt to write a first movement, but, as he stated near the end of his life, “By 1921 my style had changed so much that I was no longer capable of recapturing the spirit of 1909.” Cellist Jenö Kerpely and pianist Béla Bartók gave the first performance of the two movements on May 17, 1910. A rhapsodic air prevails in the opening movement as it unfolds in a series of juxtaposed sectional divisions. The first sounds are for the cello alone, a rising motif that will prove to be a key structural element in both movements of the sonata. (Commentators like to note that it is the same motif that opens the slow movement of Brahms’s Double Concerto.) Its descending version is equally important. In contrast to the darkly ruminative, moody Fantasia, the exuberant second movement is powerfully rhythmic and infused with the spirit of the dance. While most “unfinished” compositions lack endings (Schubert’s Eighth and Bruckner’s Ninth symphonies come to mind), Kodály’s Cello Sonata lacks a beginning. Yet, as in the case of the just-mentioned symphonies, the work seems complete despite its outward appearance as a torso. Kodály closes his sonata with a return to the opening of the Fantasia movement, now somewhat rewritten as if, with the passage of time, this material has now evolved into a new form. It makes for a most satisfying feeling of closure. Brahms’s choice of the cello as the piano’s partner for his first duo sonata is entirely appropriate in view of the composer’s predilection for warm, mellow, tenor-range instruments (clarinet and horn were also instruments he favored). Brahms wrote three movements in 1862, then put the work aside until 1865, when he wrote a finale. However, when the sonata was published in 1866, the composer suppressed the Adagio movement, leaving a sonata in three movements only. Yet Gänsbacher was somewhat justified in his complaint, for there are unequivocally passages where the cello must struggle mightily to be heard above the thick textures and powerful sound of its partner. Balance problems aside, however, the opening movement is one of Brahms’s most impassioned statements, beginning with the gentle arch of the cello’s somber yet noble opening theme, passing to the robust second theme in B minor in which both instruments share equally, and to the radiant third theme in B major, heard first in the piano, then in the cello. The highly energetic finale takes its cue from Beethoven’s last cello sonata (heard earlier on this program) in its use of fugue in a duo sonata, but to an even greater extent, the movement is a tribute to Bach. The fugal subject strongly resembles that of Contrapunctus XIII from Bach’s Art of Fugue. To carry the Bach connection a step further, some listeners hear in the main theme of the first movement a resemblance to Contrapunctus III as well. But Brahms’s finale is not fugal throughout, for there are elements of sonata form as well, notably the use of a non-fugal second subject (yet derived from the fugue’s own countersubject!). Yet Brahms welds fugue and sonata form into a movement of structural integrity and sustained momentum. Even the concerto principle comes into play, with the two contending forces of cello and piano struggling mightily for supremacy as the sonata races to its tumultuous conclusion. Murray Perahia first came onto my radar in 1972 when he won the Leeds International Piano Competition. I knew Murray’s playing through his recordings but didn’t have the opportunity to hear him live for the first time until 1983, when on a visit to London I was able to attend a recital he gave at the Royal Festival Hall. It was one of the most memorable concert experiences of my life. I was with a friend with whom I had studied music at university in South Africa, and the two of us left the hall speechless. We didn’t speak to one another until we had crossed the bridge over the Thames, to catch our Tube. Two years later (the VRS was 5 years old) Murray Perahia played a recital in Portland on a small, but wonderful piano series. How envious was I when I found out that the only way the series was able to present Mr. Perahia was through the generosity of one of their subscribers who was a Murray Perahia fan, and was determined to get him to Portland at any cost. He played his first performance for us the following year at the Orpheum and has returned to our series several times since. I have had the immense pleasure of having him practice in my home, and so has our sponsor, Martha Lou Henley. On one occasion he needed a break and went for a walk. I was panic stricken when he hadn’t returned after an hour and a quarter. Fortunately, back in those days the VRS office was located in the basement of my home, so I was able to leave the house to search for him. I did find him wandering around the side streets of Shaughnessy. On another occasion he came to Vancouver for a concert at the time of the famous summit. We had booked him into the Four Seasons Hotel, which we then had to cancel as the Summit leaders had taken over the hotel. We re-located him to the Waterfront Hotel and let his management know. Somewhere between his management and his diary there was a ‘disconnect’. I waited at the airport for five hours, calling every hotel in town every 30 minutes to see if he had checked in. Bingo! Finally, the Wedgwood Hotel said that they had just found a room for a Mr. Perahia who hadn’t had a previous reservation but had been insistent that there had been! I asked them to send someone up to lock his door and not let him out until I arrived! Each and every concert by Murray Perahia is a revelation and a deeply moving experience. I am so thankful that I have been a concert presenter at a time when Murray Perahia is at his prime. Leila Getz, C.M., O.B.C., D.F.A. Like many of the great composers before him (Bach, Handel, Mozart, Beethoven, Chopin, Liszt and Rachmaninoff, among others), Shostakovich possessed the skills of a keyboard virtuoso, and might well have sustained a successful career as such. Among his prizes was one from the First International Chopin Competition in Warsaw (1927). But Shostakovich’s compositional talent also showed itself early. His graduation exercise from the Leningrad Conservatory, the First Symphony, catapulted him at the age of twenty to worldwide attention, and he decided to devote the bulk of his efforts to composition. Significantly enough, the First Symphony contained a prominent part for the piano. Shostakovich continued to write music for his instrument throughout his twenties – about half his output during these years was for or with piano – which he also performed. Thereafter, coinciding with the sharp reduction of his performing activity, he wrote only seldom for solo piano. Among the works of his later years was the monumental set of 24 Preludes and Fugues, Op. 87, written in late 1950 and early 1951. The inspiration came principally from Bach, as it has for similar sets from other composers: Hans Huber, Castelnuovo-Tedesco (for guitar duo) and Niels Viggo Bentzon for preludes and fugues together; Chopin, Scriabin, Busoni, Debussy, Rachmaninoff and Shostakovich himself (Op. 34) for preludes alone. In 1950, Shostakovich was sent by his government as the head of a Soviet delegation to East Germany for the ceremonies surrounding the bicentenary of the death of Johann Sebastian Bach. Among the events was a piano competition in Leipzig, where Shostakovich sat on the jury. One of the contestants was the 26-year-old Tatyana Nikolayeva, whose playing of the Well-Tempered Clavier so impressed Shostakovich that upon returning to Moscow, he undertook to create a similar work himself. Unlike Bach’s two books of preludes and fugues, each of which proceeds up the steps of the chromatic scale alternating major and minor keys (C – C-sharp – D, etc. ), Shostakovich’s (like Chopin’s) move through the so-called “circle of fifths,” which begins with C major and its relative minor (A), then adds one sharp for G major/E minor, then two sharps, etc. (at this point the flat keys take over in reverse order, decreasing in number down to one – F major/D minor – where the cycle ends). The first performance presented what amounted only to a teaser: Shostakovich offered four of the preludes and fugues at a recital on November 18, 1951 in Leningrad’s Glinka Hall. The cycle was not given as a unit until a year later when Tatiana Nikolayeva performed it at the same venue in two sessions, on December 23 and 28, 1952. There is conflicting evidence as to Shostakovich’s feelings about whether the 2½-hour cycle should be played complete in performance. He himself never did so, though he recorded all of it. He did often perform the preludes and fugues in groups of three to six, as have many other pianists, notably Sviatoslav Richter and Emil Gilels. Selected numbers have been arranged for such diverse instruments as organ, accordion, double bass with piano and string orchestra. NO. 1 IN C MAJOR: The cycle gets underway with a sarabande, a stately Baroque dance in slow triple meter with its characteristic rhythmic pattern. Chordal writing alternates with flowing chromatic passages. The fugal subject is built almost entirely from the intervals of the fourth and the fifth. NO. 2 IN A MINOR: The Prelude is a toccata-like affair (“pure harpsichord textures,” says Melnikov), with a single line of rapid sixteenth-notes running in perpetual motion throughout. The Fugue has been compared to some of Shostakovich’s polkas for its jaunty, humorous mood. The five-note rhythmic cell upon which it is based recalls a jocular passage from the third movement of the Fourth Symphony. NO. 3 IN G MAJOR: The stern Prelude sounds like its inspiration could have come from a liturgical chant, while the Fugue could not be more different in character – witty, playful, dancelike, and demanding virtuosity and crystalline clarity of execution to make its effect. NO. 4 IN E MINOR: The Prelude is a three-part texture consisting of (1) ponderous, sustained octaves in the depths of the piano’s range; (2) a continuous, even stream of eighth notes, usually in the middle voice; and (3) a slower-moving melodic line that includes numerous “sighs.” (Bach associated E minor with the Crucifixion.) The Fugue is actually a double fugue. Two separate subjects are introduced in turn (the second in slightly faster tempo), then are combined fortissimo in a towering musical edifice. NO. 6 IN B MINOR: A striking Prelude built on the double-dotted rhythmic figure (extra-long notes alternating with extra-short ones) flashes fire and energy in contrast to its Fugue, notable for a flowing, placid surface. NO. 7 IN A MAJOR: The spirit of Bach hovers over the Prelude. Its meter of 12/8 (four groups of triplets) was far more common in the Baroque era than it is today. The fugal subject is based entirely on the notes of the tonic chord (A – C-sharp – E). This fugue might be considered Shostakovich’s “water music” inasmuch as the texture – glistening, sparkling, gently undulating – not to mention the continuous development of a single arpeggiated chord, bring to mind the opening scene of Wagner’s opera Das Rheingold. NO. 8 IN F SHARP MINOR: One of the briefest preludes sits beside the longest fugue by far of the twelve we hear tonight – nearly nine minutes in Melnikov’s performance. The Prelude is written in simple two-part texture, and in Shostakovich’s inimitable fashion combines a playful ambiance with a touch of the sinister. It is also the first prelude we have encountered to feature Shostakovich’s hallmark rhythmic pattern, short-short-long. The Fugue too incorporates this rhythmic figure into its fold. The subject is exceptionally long – nine measures – and thereafter unwinds in three-part texture to an unrelenting tread and highly dissonant harmony. NO. 9 IN E MAJOR: In a reversal of the process found in the previous Prelude and Fugue, No. 9’s focal weight rests in its Prelude – longer by far than the Fugue. This Prelude is also notable for its extremes of range, which cover nearly the entire keyboard; three staves are required to notate it. The Fugue is the only one of the 24 in two voices only, and exudes an atmosphere of joy and exuberance. Many listeners hear in it strong reverberations of a Bach two-part invention. NO. 11 IN B MAJOR: The B major Prelude suggests an orchestral conception, particularly the jocular, light-hearted movements of Symphonies Nos. 6 and 9. For sheer, unabashed joy and an almost reckless sense of abandon, the Fugue is hard to beat. Programme notes by Robert Markow, 2011.